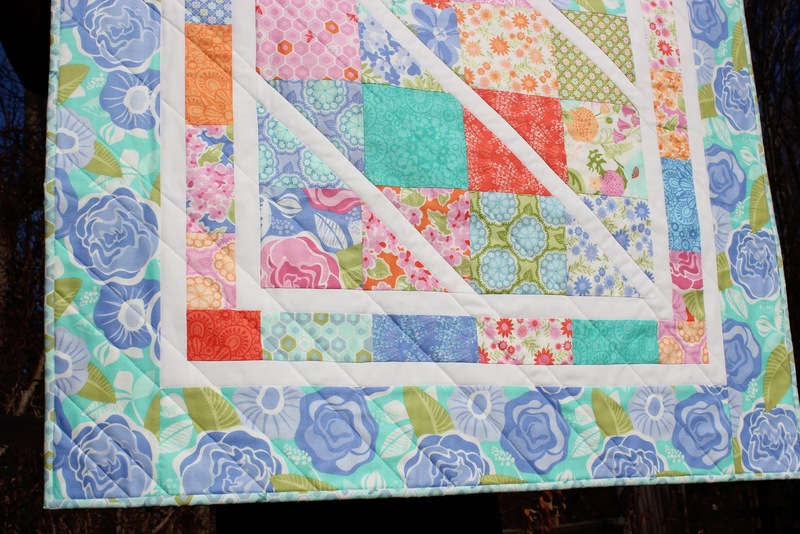 Today, I’m sharing a cute little quilt that’s perfect for crib or stroller, and because it sews up quickly it makes a wonderful baby shower gift. The small 34″ square size is just right for little hands to carry as they toddle around! 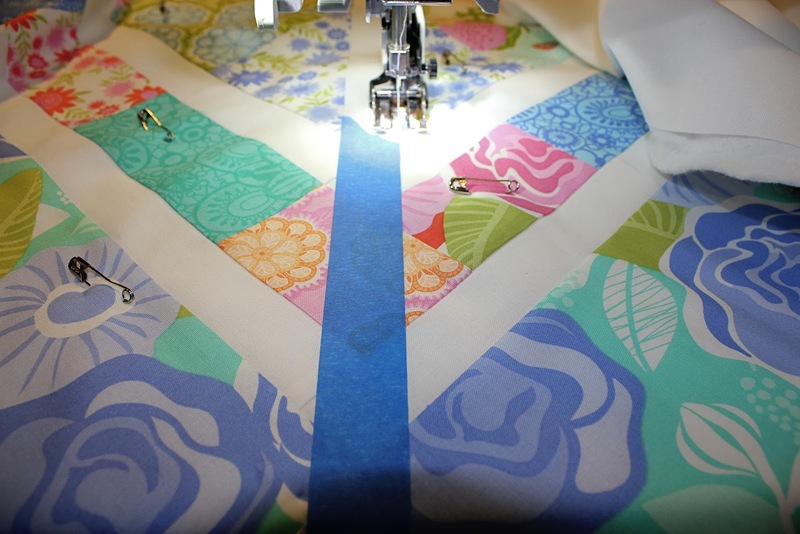 All seams are sewn with a 1/4″ seam allowance. To begin, choose (16) of your favorite 5″ charms from the pack (that’s my most fun part! ), and lay them out in four rows of four charms. Sew them together in rows. 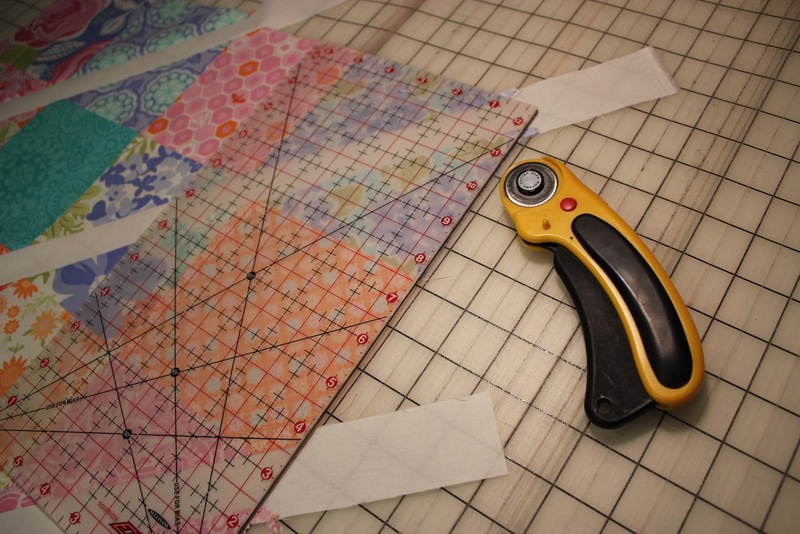 Tip: Press the seam allowances of the odd rows to the left, and press the seams of the even rows to the right ~ this allows the seam intersections to nest together nicely. Take a moment to admire your cute little quilt body. Press all the seam allowances away from the white strips so you don’t see shadowing of the seam allowances behind the white. Next, trim the extra fabric from the white strips that hang out beyond the edges. Use the corner of a ruler to square up the corners. 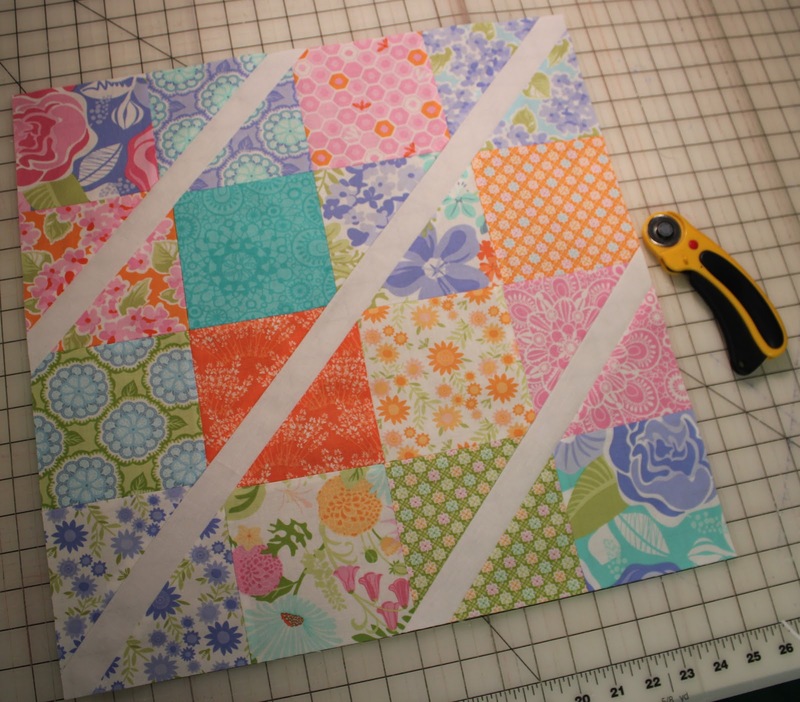 It’s Ok if it’s a little crooked because now you trim and square your quilt body to measure 18-1/2″ square. 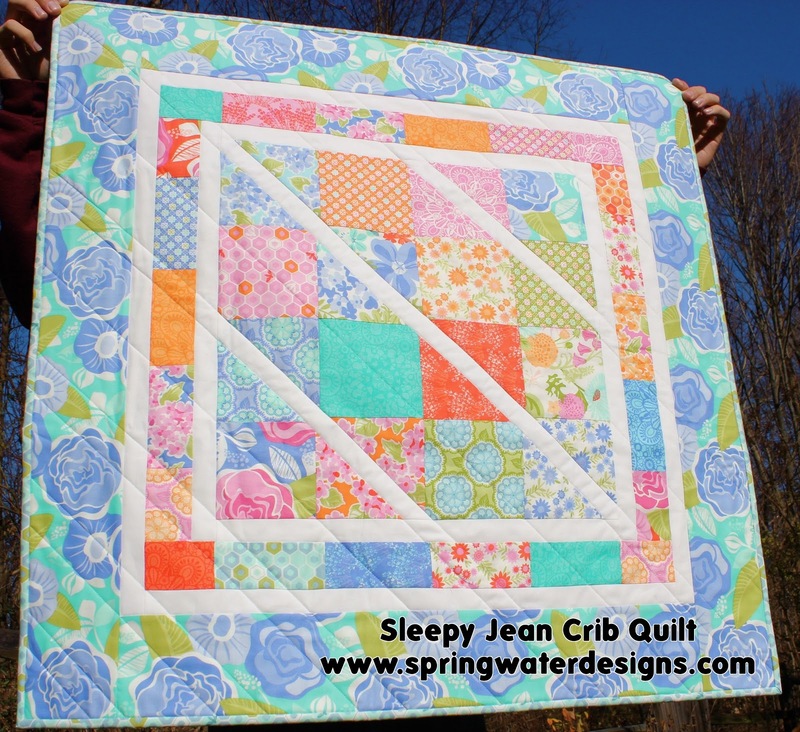 Sew the two 18-1/2″ strips to the side of the quilt body, and press away from the white strips. 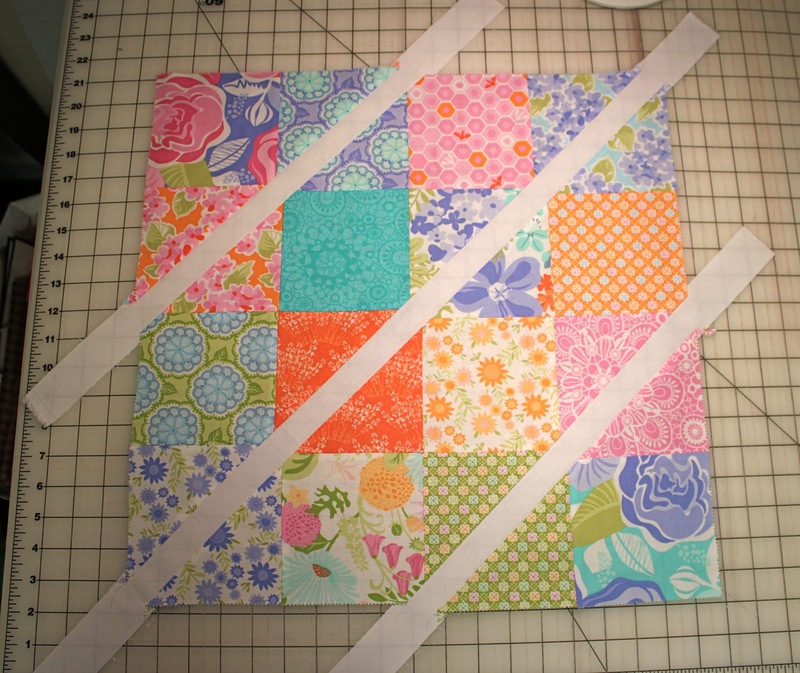 Next, sew the two 20-1/2″ strips to the top and bottom. 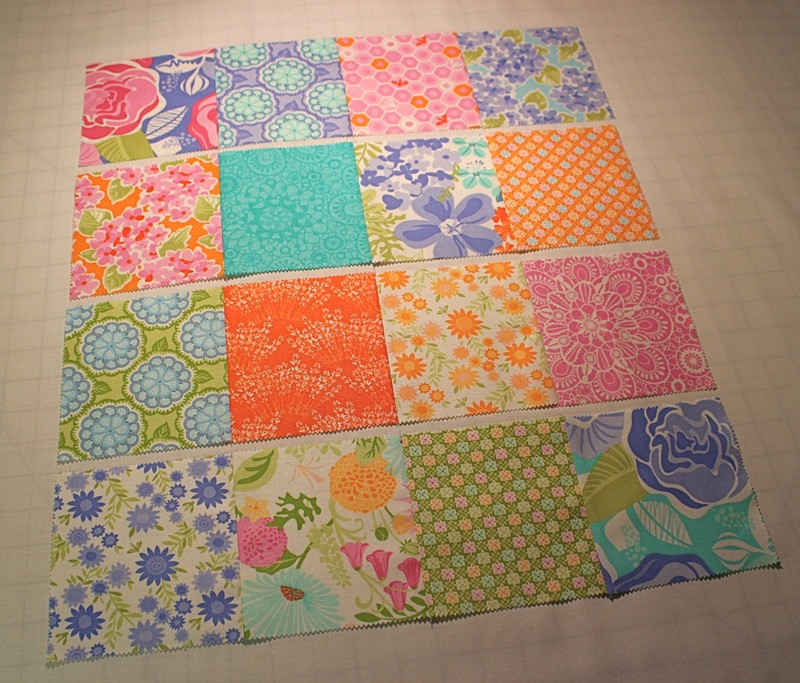 For the Pieced Inner Border, choose 21 more 5″ charms from the charm pack, and cut them in half (You can cut more of them in half for more variety if you want, that’s what I did) ~ Ultimately you will need (22) 2-1/2″ x 5″ rectangles. Center and sew the five-long strips to the top and bottom of the quilt. 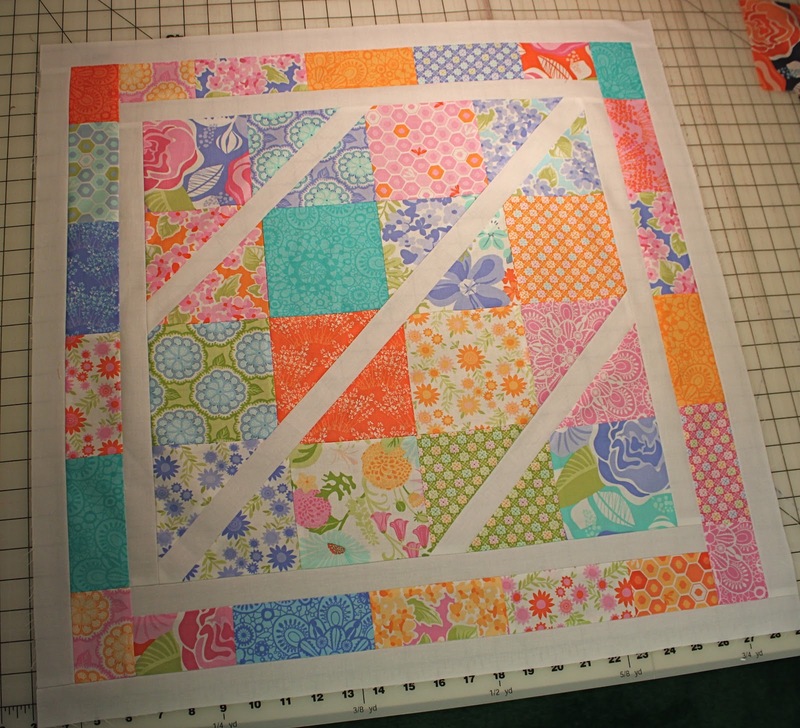 Press the seam allowances towards the pieced border and away from the white fabric. 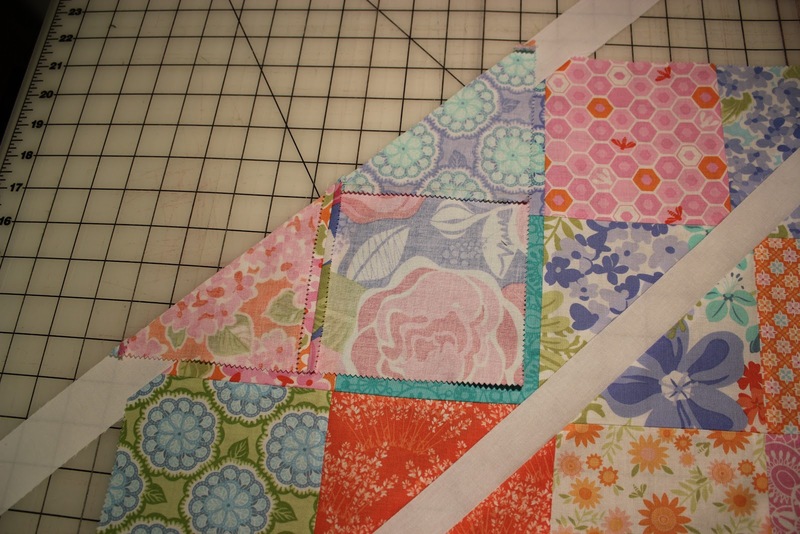 Trim off the extra fabric that sticks out beyond the side edges even with the sides of the quilt. 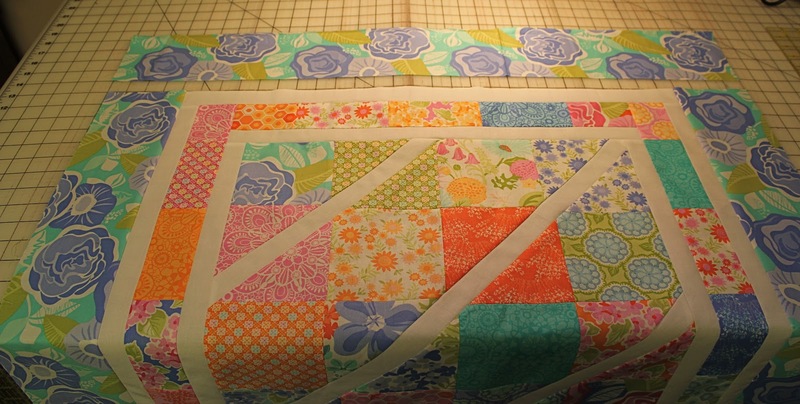 Then, center and sew the six-long colored strips to the sides of the quilt, and again press away from the white Inner Border (Trim up the excess that hangs over the edges again). Just like before, sew the shorter ones to the sides of the quilt, press away from the white, and then sew the longer ones to the top and bottom of the quilt. 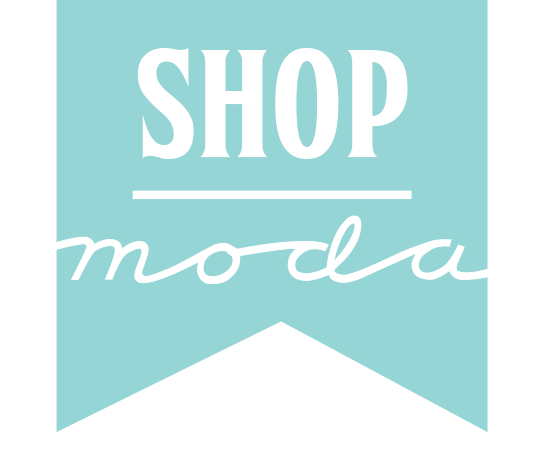 From the Outer Border fabric, cut (4) 4-1/2″ strips, and sub-cut them to: (2) 4-1/2″ x 26″ strips, and (2) 4-1/2″ x 34″ strips. 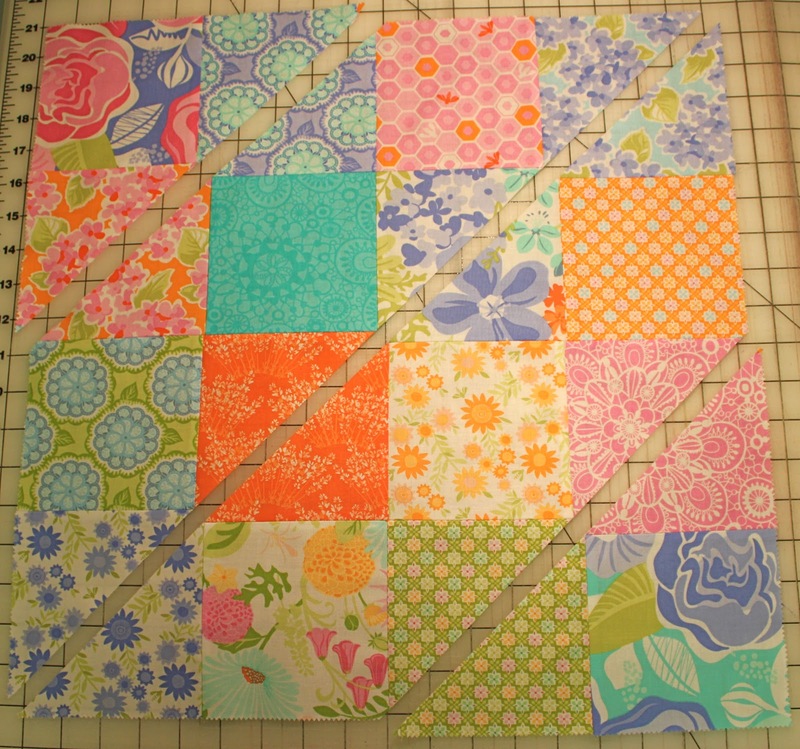 Again sew the shorter strips to the sides of the quilt. Press toward the outer border fabric. 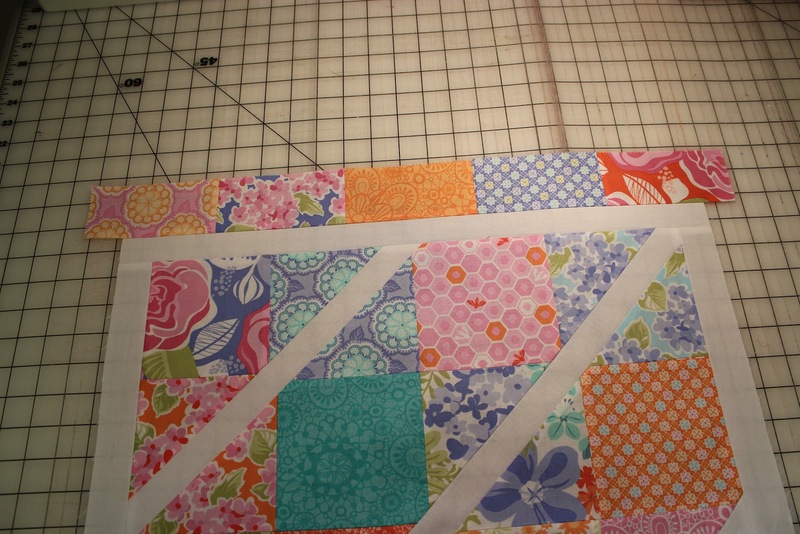 Then sew the longer strips to the top and bottom of the quilt. 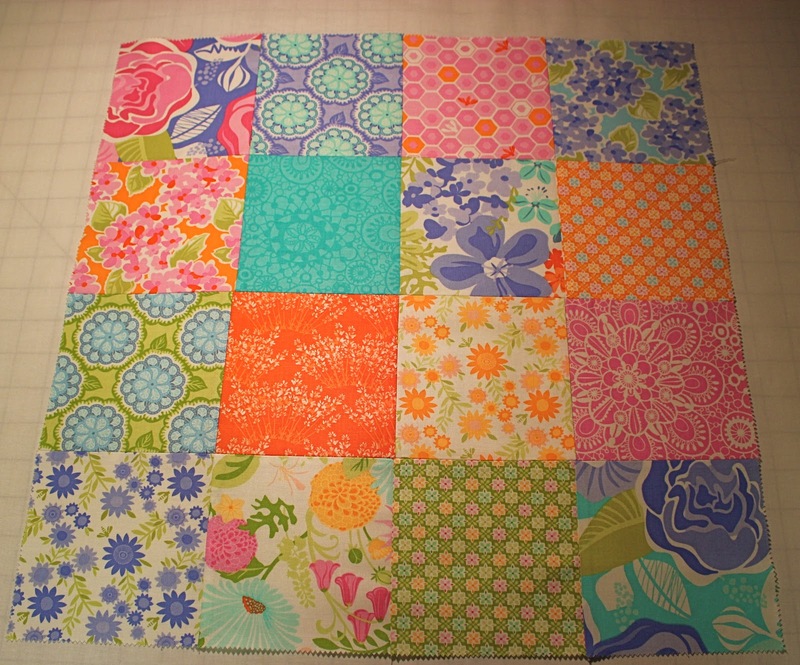 Now layer the quilt top with batting and backing, and quilt as you choose. 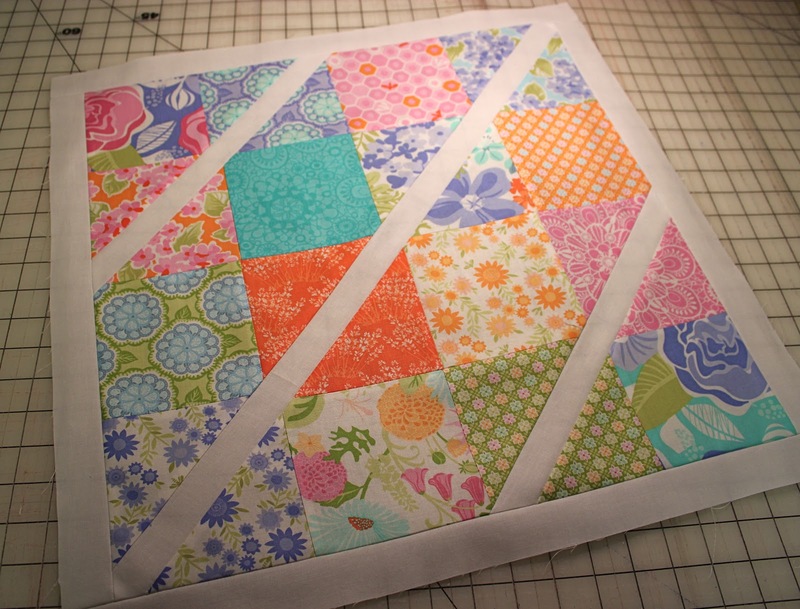 I quilted mine with diagonal lines in the ditch of the white inset slashes and parallel to them. 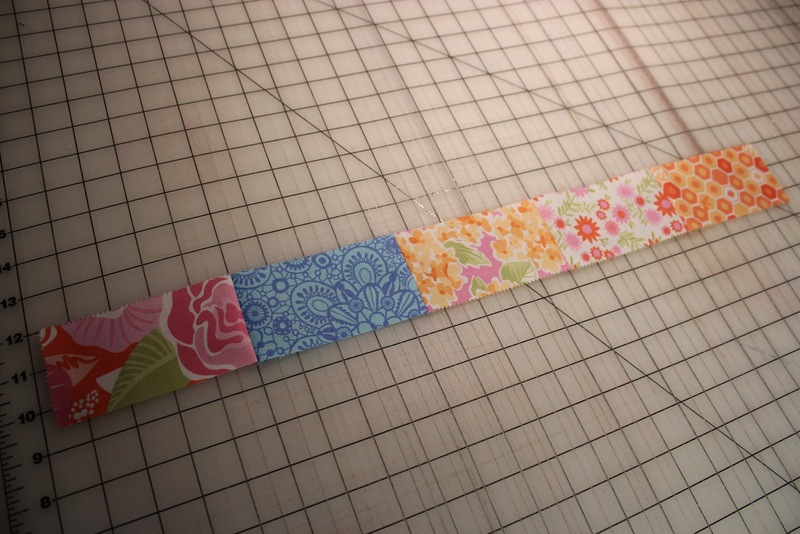 Tip: Use 1″ wide painters tape to keep your quilted lines straight when you extend them out into the outer borders, so you don’t have to mark your quilt top. 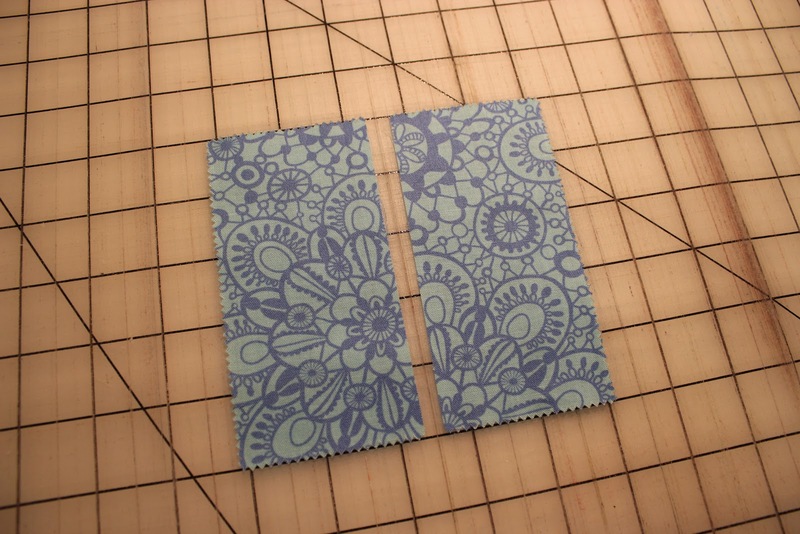 Finally, cut (4) 2-1/2″ strips from the other coordinating fabric to bind your quilt. 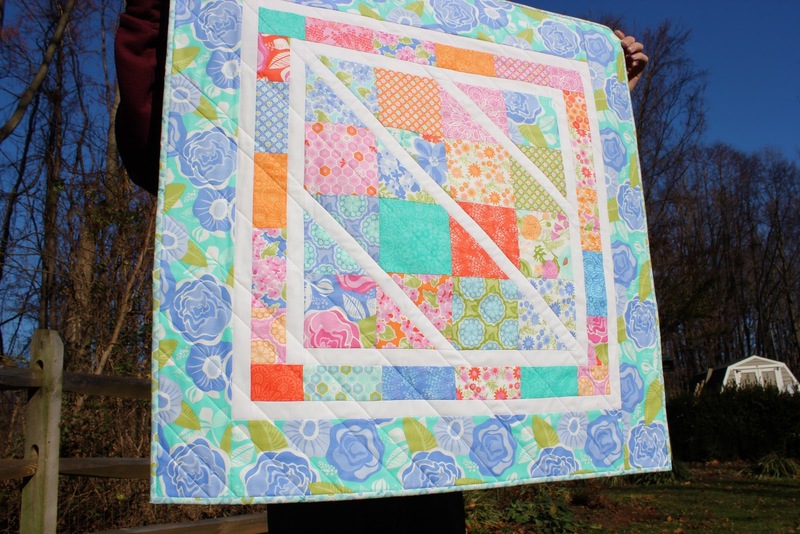 I sewed my binding strips end to end and then sewed them to the front of the quilt all around the edge using my walking foot, and then turned the binding to the back and hand stitched it down to the back of the quilt ~ but you can bind it in any method that you wish! 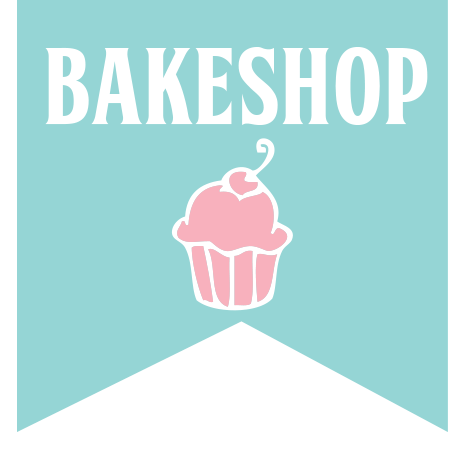 Enjoy the day and happy New Year!